Injured by a driver that was texting and driving? The Tampa Auto Accident Injury Attorneys of Fernandez and Hernandez can help. And the legislature is trying to help now too. A bill that would allow police to pull drivers over and ticket them for texting and driving passed its first hurdle on January 9, 2018. The bill unanimously passed the first committee and it allows law enforcement to make texting a driving a primary offense. Meaning, if law enforcement sees you texting and driving, they can pull you over immediately. Previously, it was a secondary offense, meaning you can get a ticket but only after you were stopped for another reason. If passed, law enforcement can say they saw you texting (or emailing or Facebooking or whatever on your phone) and pulled you over. Of course, there is an exception. The bill would not restrict using a phone for turn-by-turn directions or for making phone calls or for using hands-free devices. 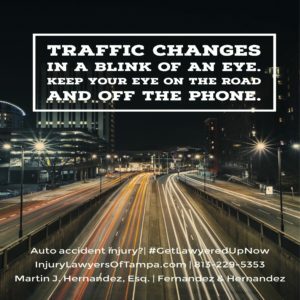 If you have been injured by a driver that was texting and driving, call Tampa Auto Accident Injury Attorney Martin Hernandez of Fernandez & Hernandez at 813-229-5353. Is Texting and Driving or Drunk Driving More Dangerous? What is more dangerous? Texting and driving or drunk driving? Studies have shown that distracted driving (caused by drivers looking at their cell phones, radios, texting, emails, etc) is increasingly becoming more dangerous than a driver who is intoxicated or under the importance of drugs or alcohol. The number of fatalities caused by distracted driving increased 28% between 2005 and 2008 alone. In 2012, 3,328 Americans died in crashes involving a distracted driver (mostly texting and driving), while 10,322 people were killed in alcohol-related crashes. However, the number of non-fatal accidents cannot be calculated as most of at-fault parties do not admit to being on their cellular devices (ie, texting and driving) at the time of their accident. Why? Because if you were texting and driving at 70 mph and not looking at the road, within the 3 seconds you looked at your phone you have traveled more than 308 feet! Now, ask yourself how many things change in 300 feet (a football field)? Have You Been Injured by a Driver that was Texting and Driving? Texting while driving remains a dangerous problem, often leading to serious or even fatal consequences because of distracted drivers. In the state of Florida, there is currently a ban on texting while driving, but enforcing it is easier said than done. In order for an officer to stop a driver allegedly caught texting, he or she must have also committed a violation of some other offense. This basically makes the ban useless. That may soon change as lawmakers consider upgrading texting while driving from a secondary into a primary offense. Originally passed in 2013, Florida officers have issued very few tickets for texting which carries a minimum $30 fine. The new proposed laws would allow law enforcement officers to stop anyone they reasonably believe to be texting and driving without having to stop them for a different citation. Per the National Safety Council, texting can significantly impair a driver, reducing their ability to process moving images by up to a third. Other studies show that an impaired driver (i.e. drunk driver) may actually be less dangerous than a texting driver as the texting driver is not looking at the road. Las personas que conducen al enviar o leer mensajes de texto son un 23% más probabilidades de estar involucrados en un accidente automovilístico que otros conductores. Las personas que conducen al enviar o leer mensajes de texto son un 23% más probabilidades de estar involucrados en un accidente automovilístico que otros conductores. Un accidente ocurre típicamente dentro de una media de tres segundos después de que un conductor se distrae. Sólo para poner en prospectivo, la distancia recorrida en cinco segundos de conducción a 55 mph es equivalente a la longitud de un campo de fútbol. También tiene, en promedio, 5 segundos para leer un texto. En pocas palabras, no hace texto y conducir. Datos de los mensajes de texto y de conducción • El Departamento de Transporte de los Estados Unidos señalan que los teléfonos celulares están involucrados en 1,6 millones de accidentes automovilísticos cada año que causan medio millón de lesiones y toman 6.000 vidas. De acuerdo con FocusDriven®, hasta el 80% de todos los accidentes implican algún tipo de distracción del conductor. Durante cualquier momento del día, el 11 por ciento de los conductores están hablando en sus teléfonos celulares, según la Administración Nacional de Seguridad Vial. De acuerdo con el Instituto de Transporte de Virginia Tech, los mensajes de texto mientras se conduce es seis veces más probabilidades de causar un accidente automovilístico que conduciendo cuando intoxicado. El Instituto de Transporte de Virginia Tech instalado cámaras en cuadros de mando dentro de cabinas de camiones. A partir de las secuencias de vídeo, en promedio se llevó cinco segundos con sus ojos de la carretera cuando las distracciones con experiencia de conducir. Individuals who drive while sending or reading text messages are 23% more likely to be involved in a car crash than other drivers. A crash typically happens within an average of three seconds after a driver is distracted. Just to put in prospective, the distance covered in five seconds of driving at 55 mph is equivalent to the length of a football field. It also takes, on average, 5 seconds to read a text. In short, don’t text and drive. According to FocusDriven®, up to 80% of all crashes involve some form of driver distraction. The Virginia Tech Transportation Institute installed cameras on dashboards inside truck cabs. From the video footage, on average it took five seconds with their eyes off the road when driver’s experienced distractions. Originally passed in 2013, Florida officers have issued very few tickets for texting which carries a minimum $30 fine. The new proposed laws would allow law enforcement officers to stop anyone they reasonably believe to be texting and driving without having to stop them for a different citation. Per the National Safety Council, texting can significantly impair a driver, reducing their ability to process moving images by up to a third. Other studies show that an impaired driver (i.e. drunk driver) may actually be less dangerous than a texting driver as the texting driver is not looking at the road. 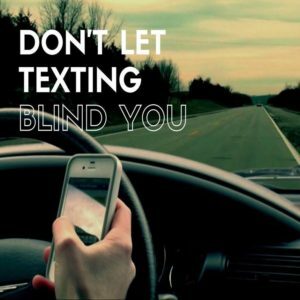 If you have been injured by a driver texting or otherwise distracted, call Tampa Attorney Martin Hernandez at 813-229-5353.